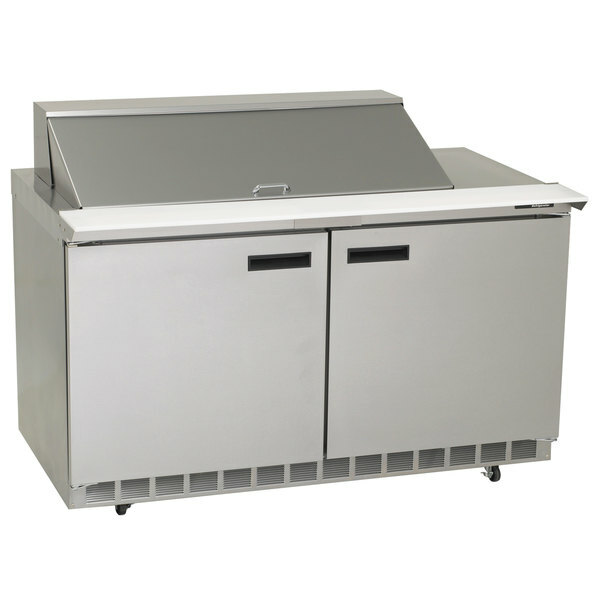 Thanks to its innovative front-breathing design, the Delfield 4460N-12M mega top sandwich / salad prep refrigerator can be pushed flush against a wall, or built into a cabinet or counter, to help conserve valuable space in your busy kitchen, deli, or pizzeria. The ingredient rail can hold up to (12) 1/6 size food pans (included), so you'll always have the toppings you need close at hand. Additionally, an 8" wide, antimicrobially treated polyethylene cutting board provides ample space to prepare delicious sandwiches, salads, and subs piled high with fresh meats, colorful toppings, and savory sauces. Two epoxy-coated wire shelves help you organize back-up and bulk ingredients in the prep refrigerator's lower cabinet. To the right of the pans is 28 3/8" of countertop space, ideal for storing condiments, supplies, or even food prep equipment like slicers and veggie choppers.